It seems that I am forever recycling. I do not know if it because I have lived so long in the Seattle area where it seems people are compulsive recyclers and reusers or if it is just the habit of keeping stuff that might be useful someday. Either way, it seems that the compulsion to recycle and reuse has entered my writing psyche. 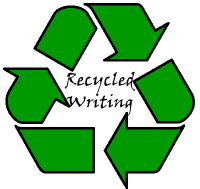 In reality, I do not really want to recycle or reuse old writing ideas. It just seems that life is circular. That we do the same things over and over and over again. I feel that way sometimes. That I have written about something before. And sometimes I have. Even when I am writing about something new my wife or kids have said or done, I can often look back and see that I have written about it already. Or at least about something very similar. It is as if life is circular. That is why I sometimes have a difficult time writing. I feel like a broken record. A broken record. A broken record. Skipping back again and again to some thought until somebody pounds the table and gets the needle moving along its merry way again. But life is like that. It really is circular. We do things that we have done before. Sometimes to our own detriment. (They say that insanity is doing the same thing over again expecting different results.) We all find ourselves doing the same things day in and day out without really thinking much about the circle. When it comes down to it, Solomon was right. There really is nothing new under the sun. Still, even though there is nothing new, I ought to be able to write something fresh and exciting (or at least whimsical) each week. I ought to be able to get out of the granola mindset that we can just reuse or recycle everything. I ought to be able to write something fresh and exciting (or at least whimsical) every week. But alas. Try as I might, there are times when there are no fresh ideas. When I discover anew that there is nothing new under the sun. I better stop here lest the needle really break. Before I repeat myself again. Before they kick me out of the Granola Guild for reusing and recycling too much.